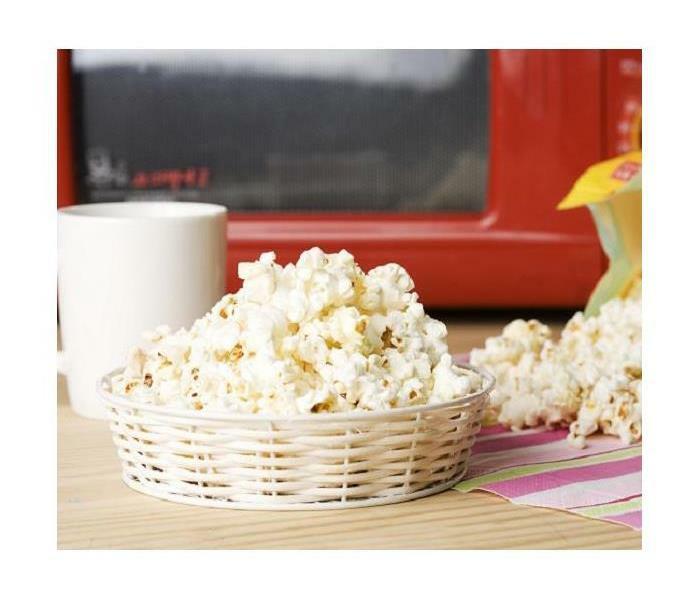 Do the snacks in your break room have the potential to cause fire damage? Fire damage can happen to a commercial property or business for many reasons. Natural disasters such as lightning are rare or more common causes like electrical wiring overloads and failures, arson and employees and residents misusing appliances such as microwave ovens. The foundation for a successful restoration begins with commercial fire damage cleanup. In San Antonio, SERVPRO was called to assist a dry cleaner establishment that had a fire in a small backroom area. An employee made popcorn set the timer on too long and left the area. Although extinguished quickly, the fire left residue throughout the back area of the facility and a strong odor. The owner thought this would harm his business because potential customers were going to encounter the smell that from the first moment they walked through the door. When our technicians arrived at the site, they immediately had the owner turn off the HVAC and contained the breakroom area to stop any further issues with soot and odors spreading. We moved the clothes the dry cleaner had on site to a locked, separate glass area, so they were not in danger of any contamination from soot or odor. Our technicians began hand vacuuming the fire extinguisher residue and removed the charred microwave that was contributing heavily to the smell in the room. Once removing the visible loose debris, SERVPRO techs wiped down the surfaces with our professional-strength cleaners to eradicate any fire damage residues remaining, and this lowers odors. To ensure that we left no odor-causing particulates in the area, our technicians set up an air scrubber which pulls air in the room through a series of HEPA-filters and can capture tiny particles smaller than the human eye can see that are still capable of causing odors. After completing the cleanup efforts, the owner was walked through the area to ensure our work met his approval. SERVPRO of Braun Station knows commercial fire cleanup is crucial to getting your business back on track. Call us at (210) 267-2159 when you need fast, professional restoration for your fire loss. Read more about Brackenridge Park here. Storms can affect the area without warning and cause flood damage in your home. Your best recourse is to contact SERVPRO. Intense flooding is common in the San Antonio region, encouraged by the collision of moist, warm air from the Gulf with cooler air from the north. The air masses mix and often heavy rain results. The city’s location south of the Hill Country adds the concentration of the rain runoff from higher elevations to the situation. If your home finds itself in the path of one of the region’s flash floods you soon discover why we are a local flood remediation leader. Since we live, work, and established our business in the area, we are extremely familiar with flood damage in San Antonio. More importantly, we commit to responding to flood calls fast and with a full complement of highly-qualified technicians and state of the art equipment. Our dedication and commitment to restoration best practices are why we deliver successful results even when the flooding is severe. Flood damages can have long-term results when not mitigated swiftly. The structural integrity of your home can be compromised if the waters flowed in with great force. Water allowed to remain standing for longer than 24 to 48 hours exposes your home to the risk of mold damage. Years of experience and advanced training in flood damage restoration explains why SERVPRO is Faster to any size disaster, especially when it involves flood devastation. Investment in skilled crewmembers and the most efficient equipment is why SERVPRO flood restoration projects resolve quickly and successfully. High-efficiency water extractors and pumps move the water out, and then air movers, heaters, and dehumidifiers take center stage for structural drying. IICRC-trained technicians operate the equipment flawlessly, adjusting as needed to achieve the results desired. Pack-outs of flooding scenes contribute to excellent outcomes. Water and debris removal and drying are easier in homes cleared of contents. The skill of our production facility technicians is why SERVPRO can surprise and delight customers who feared precious heirlooms, mementos, pictures, and documents were ruined. Document freeze-drying, specialized soft-article cleaning strategies, controlled thermal drying of furnishings, and immersion cleaning tanks are just a sampling of the strategies we use to return your life to normal after flooding. SERVPRO of Braun Station awaits your call and pledges its best effort when flooding devastates your home. Call us at (210) 267-2159 day or night year round. Click here for more information about the city of San Antonio. Is Professional Flood Damage Remediation Necessary in San Antonio? DIY efforts often come up short and can cause secondary damage. Flooding in the San Antonio area has been frequent in the past. Climate change might make the problem more prevalent and intense in the future. Because we anticipate severe flooding does not mean recovery is straightforward or a do-it-yourself proposition. If your home is in the path of flash flooding, be sure you seek the assessment of the scenario by our dependable remediation team. Managing the cleanup on your own can worsen the outcome. When your home suffers from flood damage in San Antonio, it is highly likely that the water and debris that intrudes into your home are contaminated. Chemicals, road waste, insects, dead animals, sewage, and more can be in the mix. Quantities of silt and mud make it complicated. Removing the debris and sludge along with the water needs careful handling and often containment of the fluid for appropriate hazardous waste disposal. Our trained and well-equipped crews prepare for these challenges. Speed is essential when cleaning up flood damage, an overwhelming proposition when you are trying to deal with it on your own. SERVPRO crews arrive with a seasoned manager to assess and devise an agenda to mitigate the situation and the workers to carry out the plan designed. Each signature green truck carrying our team to your address has pumps and extractors to remove the water, as well as tools to remove mud and silt. Our crews take care to avoid exposing your lower levels to collapse when we extract the water. IICRC training and job experience guide us if many feet of water invade your home. We extract the water in a controlled manner to prevent the pressure from the saturated ground outside your home from damaging the foundation. SERVPRO scans for hidden water and measures moisture levels in structural components to ensure that we remove all flooding. Once the standing water evacuates, we reach for the drying equipment also in our service trucks. A balance of air temperature and movement accelerates evaporation of water absorbed into building materials. Once vaporized our desiccant and evaporative dehumidifiers collect and contain the water for disposal away from your home. To ensure drying is effective behind walls or other barriers we frequently make flood cuts. SERVPRO of Braun Station exists to help the communities we manage catastrophes like flood damage. Make a call to (210) 267-2159 to schedule an evaluation as soon as the water rises inside your home. Read more about San Antonio here. Regardless of whether water damage starts from a storm or a pipe break, the experienced technicians at SERVPRO can effectively remediate any damage. Water loss incidents that affect your San Antonio home present unique threats that homeowners often cannot manage or overcome on their own. From addressing spreading saturation to reducing the conditions necessary to facilitate mold growth, a rapid response to these emergencies is critical. Much like the response that you need to address the primary threats when the disaster first occurs, premier cleaning services like our team provides can help to address lingering effects after mitigation work completes. All emergencies that create water damage in your San Antonio home require a fast response from trained IICRC-certified professionals like our SERVPRO team. As a large loss recovery team, we have a broad inventory of recovery equipment to provide fast extraction and efficient drying solutions for water damage incidents occurring in your area home. Our response team is available 24/7 to roll out at a moment’s notice for emergencies that threaten your property. Cleanup and recovery often occur after these vital mitigation steps, and even follows reconstruction when necessary. Many of the preserved structural elements and flooring materials do require focused cleanup and restoration efforts to make these disasters “Like it never even happened.” With materials like carpeting, our team can utilize our advanced equipment for pre-rinse cleaning, hot water extraction, or steam cleaning to revitalize the look and feel of soiled carpets. Likewise, reconstruction and restoration efforts can often leave debris, dust, and residues on surfaces that require focused cleaning to return to preloss condition. Our experienced SERVPRO professionals can work to scrub all exposed surfaces, clean hard flooring materials, deodorize contents and affected areas of your home, and address any other lingering concerns before the final walk-through with our customer to showcase the result of our efforts. While mitigation work often is a focal point of restoring water damage in your home, we have many phases critical to returning your property to preloss condition. Our SERVPRO of Braun Station team offers comprehensive support from the initial inspection through the final walk-through, helping to save you money and time on restoring your damaged home. Give us a call anytime you need us at (210) 267-2159. Heavy storms and high winds have the potential to cause limbs from trees to fall and damage your home. For as inviting as the natural light can be to your San Antonio home, grand window layouts can also present potential threats when your home encounters one of the many severe storm systems expected throughout the year. When trees get pushed over or split due to excessive winds, lightning, or other damages, these significant additions to your property can find their way to the windows you have installed and break them out. As alarming as this situation might be, the flooding that can result from this exposed portion of your home can become even more threatening. 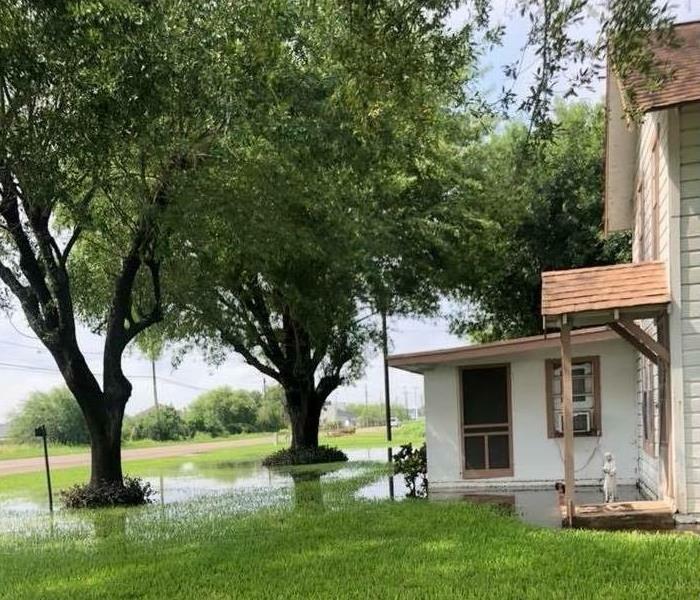 There are many homes throughout the area and its smaller surrounding communities, so storm and flood damage in San Antonio after a severe storm can affect many properties simultaneously. While there are many steps to recovering your home after substantial damages like this, you need a team of professionals that can arrive fast with the expertise to handle all phases of the job through its completion. Our SERVPRO team offers comprehensive support in flood damage situations to handle mitigation, assessments, reconstruction, and final restoration work that returns your damaged home to preloss condition. Our professionals can arrive quickly with the equipment to begin extraction while our licensed contractors board up the areas broken out from the wind or falling trees. We can remove the tree or its limbs from against your home as well to further protect it from continued water damages. Once mitigation completes, our contacting division can step in immediately to repair and reconstruct damaged areas of your property. The faster that our SERVPRO team can get notified of the situation the better able we are to protect your home against threats from flood effects. In the right circumstances, many of the saturated materials and affected areas can get fully restored without the need for further demolition and reconstruction. It is essential to secure professional restoration services immediately when disasters like this strike, as you are rarely the only home in the area affected by the severe weather. Our SERVPRO of Braun Station rapid response team can work to make flooding in your home “Like it never even happened.” Give us a call at (210) 267-2159. Read more about the King William Historic District here. What is a Pack Out and How Does It Help with Flood Damage Restoration in San Antonio? Use SERVPRO’s pack-out option to remove furniture from flooded areas of your home. This allows your home to dry faster. 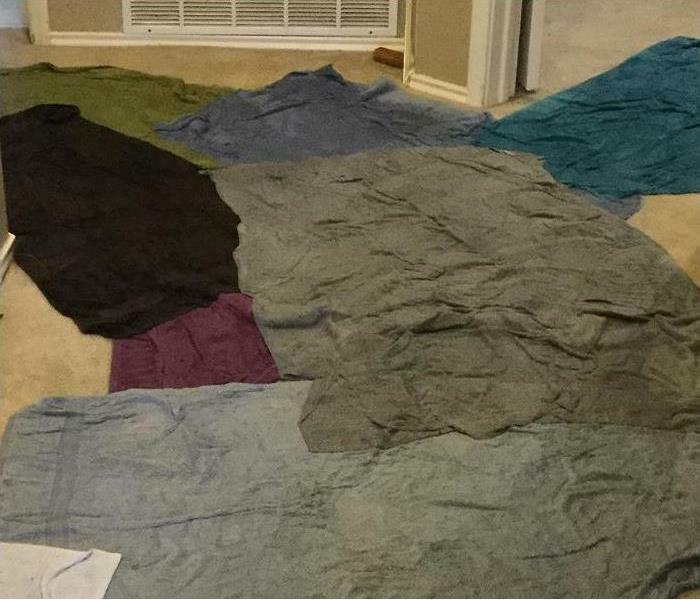 Flooding in your San Antonio home can be a brutal experience. Central Texas from Dallas to San Antonio has the unfortunate nickname of “Flash Flood Alley.” Heavy rains can change the landscape from parched and afflicted by drought to many feet deep in dangerous moving water in a short time. If your home is in the path of a flash flood both the structure and the contents of your dwelling can be at risk. One of the ways residents improve their odds for successful recovery from flood damage in San Antonio is to take advantage of our pack-out option. Removing furnishings and household and personal possessions immediately have dual benefits. The articles chosen for pack-out can receive specialized attention while the structure and fixtures can be dried out more efficiently emptied of these items. SERVPRO uses a well-designed and detailed protocol to inventory and track items our technicians remove from the flooded areas of your home. Our Contents Claim Inventory Service (CCIS) utilizes digital documentation paired with lists and a barcode system to keep track of the possessions we transport to our production facility. Evaluation of the flood damage done to pack-out inventory permits SERVPRO to keep you and your insurance company apprised of articles we can save, including the methods used, and which we determine are unsalvageable. Our production technicians use innovative cleaning and drying techniques to rescue items you might consider ruined. We have freeze drying for paper and thermal chambers for electronics. Removing a significant amount of furniture and stored items from the flooded levels of your home makes it much less stressful to remove water and design structural drying configurations. Heavy furniture and a wide range of stored items otherwise would need to be continuously moved as the water removal and drying occurs. SERVPRO technicians can reposition equipment more efficiently, and the soaked items out of the space cannot contribute to higher humidity levels in the work area. SERVPRO of Braun Station is ready to help residents struggling with the challenges of overland flash-flooding. Call for an assessment and discuss a pack-out plan at (210) 267-2159. Water can ruin carpeting and requires fast extraction and drying. Whenever water loss incidents occur within your San Antonio home, many areas and items become immediately at risk. 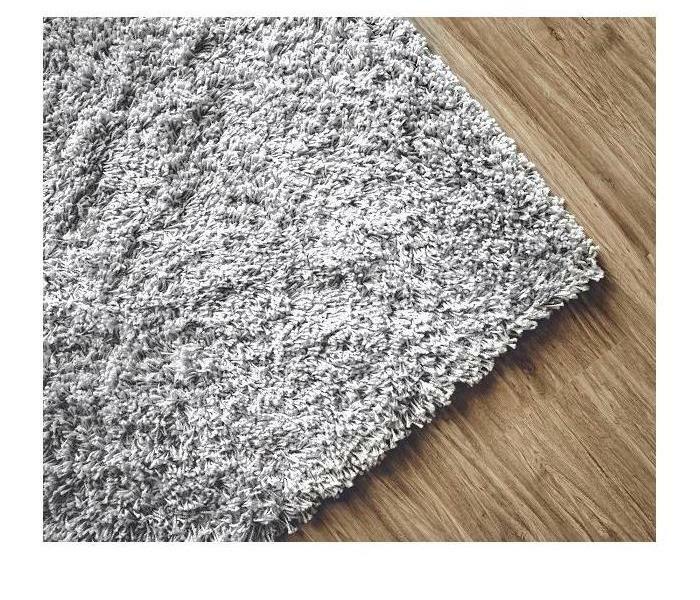 Carpeting is a magnet for dust, debris, and dirt already, and when exposed to pooling water, can also quickly become saturated to the subflooring material. Even with conventional drying methods, homeowners often cannot keep up with the exposure and saturation becomes too deep to dry out without professional assistance. Our team can help. For water removal needs in your San Antonio home, time is of the essence to get the process started as promptly as possible. The longer that exposure occurs with areas of your home, the more damage that can result. 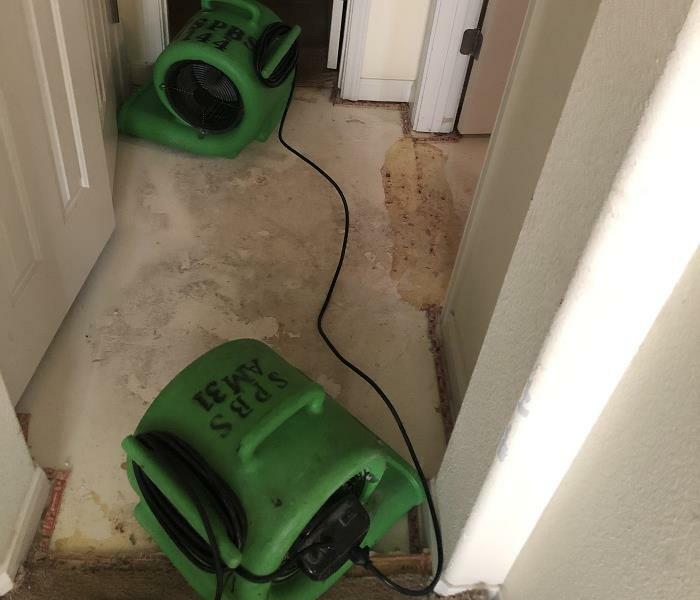 Our SERVPRO team can respond quickly to an emergency like this with extraction equipment and drying tools that can preserve and protect affected materials that did not become too badly saturated or distorted by the water. With restoring carpeted areas of your home, we have a few options to protect and preserve these materials from requiring replacement. The first of these involves the use of our ROVER equipment. This remote-controlled weighted system rolls over carpeted areas, and with its heavyweight, pushes moisture and water to the surface for collection by the high-powered vacuum on the machine. This equipment can affect the carpeting and into the subflooring, helping to reduce saturation levels noticeably. Floating carpets is another tactic that our SERVPRO team can use to recover damp carpeting in your home. We pull up the edges of the carpets from the walls and allow our air movers to blow underneath it. This machine forces heated air into both the subflooring and the carpets when positioned between them, which can help to dry out exposed areas quickly. While there might be many areas of your home that get affected by a water loss incident, you should rely on the team that can help you restore your property entirely. Give our SERVPRO of Braun Station rapid response team a call anytime that you need us at (210) 267-2159. Why SERVPRO for your Commercial Properties? Whether you serve customers on a daily basis or work from a private office, protecting your facility from water damage is essential for smooth daily operations. The following preventative measures can prepare your building for spring showers to come. 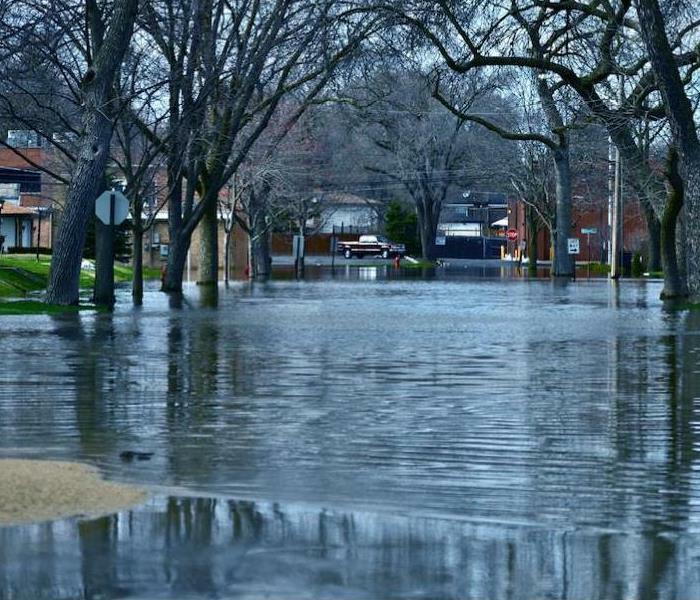 Here is what you should know about preventing flooding at your facility. If your facility has a basement, don’t forget to periodically inspect it for foundation cracks or other issues. Make sure to have any cracks patched and caulked so the room isn’t flooded after the next heavy rainstorm. You can also install a sump pump to remove excess water as well. Property elevation plays a big role in your risk for water damage. You can avoid potential flooding by altering your landscaping to ensure that water flows downhill and away from the building’s foundation. Use downspouts to direct water away from the building as well. You should also schedule a property assessment to identify flood-prone areas and then work with a landscaper to fix these issues. It never hurts to look at the weather forecast. When you know rain is on the way, double check that all gutters, drains, and downspouts are clear of leaves and other debris. This way, you won’t have to worry about clogs causing water to back up and leak into the building. If your facility has been affected by water damage, contact SERVPRO of Braun Station in San Antonio, TX. Serving Bexar County and the surrounding areas, they provide a variety of cleanup and restoration services, including for damage from fire, water, and mold. Locally owned and operated, their IICRC certified team seeks to treat each customer as a friend of the family to give you the best quality service. To learn more about how they can help your property, visit them online or call (210) 267-2159. 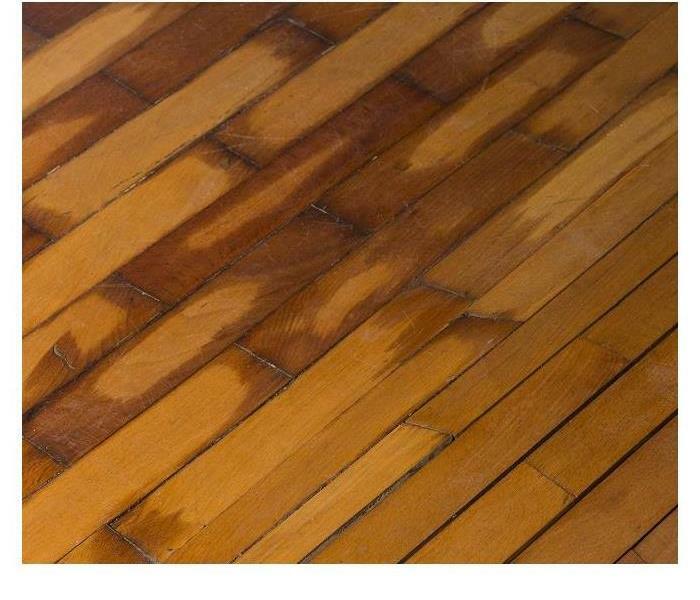 Water loss events are damaging to hardwood floors and need immediate remediation. One of the biggest mistakes a San Antonio homeowner can make is to fail to arrange for professional removal and drying services when water invades. Water might seem unlikely to cause significant problems if it is clean and allowed to drain away, but it can infiltrate deeply and destroy building materials. A bucket and mop or a wet or dry vacuum is an inadequate substitute for the work of trained water mitigation technicians. Your home is worth too much to risk, why engaging our services is necessary. The destructive effects on both structural components and contents are profound when unabated. Water removal in your San Antonio home must be done rapidly, assisted by the tools and training only a professional restoration company can supply. 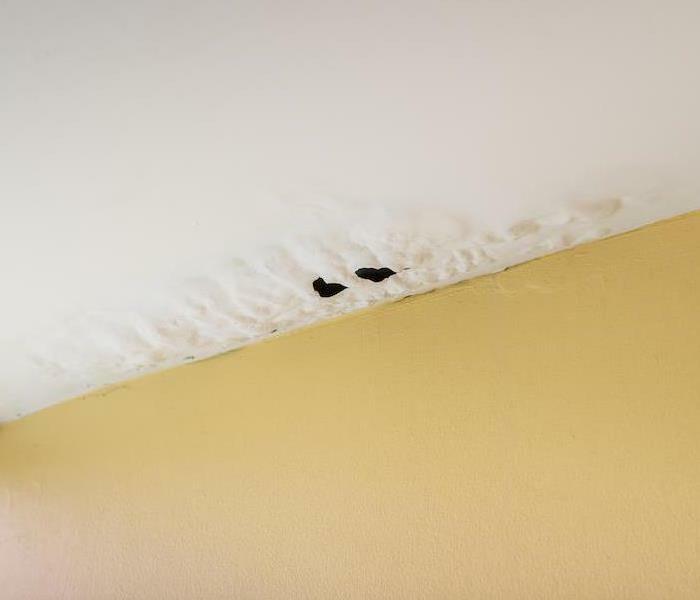 Less than complete removal of the excess moisture from the water event invites continuing deterioration of drywall, ceiling tiles, flooring materials and more which is why SERVPRO technicians continually train in a wide range of strategies to extract as much water as possible. Pumps and wanded extractors suction the majority of water. We then take the remediation process one step further and use effective structural drying techniques to reduce increased moisture levels in porous materials. Special handling gives the best results with materials like hardwood floors. Preserving beautiful and functional fixtures is why SERVPRO uses advanced equipment including drying mats to extract water more deeply. Taping down the mats creates a seal, and hoses attached to the mats connect to powerful suction. The mats are moved across the surface, extracting the remaining moisture from all layers of the flooring. Similar action pulls the moisture from other porous materials and gives access to cavities behind walls without significant flood cuts. Throughout a water mitigation project, SERVPRO technicians measure and monitor moisture levels in the structural components of your home. These measurements assist us in establishing drying goals. Air movers, heaters, and dehumidifiers create conditions that move water into the air as vapor to be captured by evaporative or desiccant dehumidifiers for disposal. Eventually, the moisture returns to normal levels, and final restorations minimize the risk of mold growth or further deterioration. Water removal is a job for the professionals, why SERVPRO of Braun Station is your reliable helper after a water loss. We are a call away at (210) 267-2159, 24 hours a day, 7 days a week. Click here for information about Alamo Plaza. Mold spreads quickly when the conditions are right. Contact SERVPRO to investigate the cause and remediate the damage in your home. Many of the natural disasters that can affect Leon Valley homes have clear and concise damage points that make it evident where restoration was necessary. Not all of the threats to your home have such clear causes and simple recovery solutions, however. Mold growth requires a damp environment for spores to seat and thrive, but how this area becomes moisture-ridden can often be multiple possibilities. 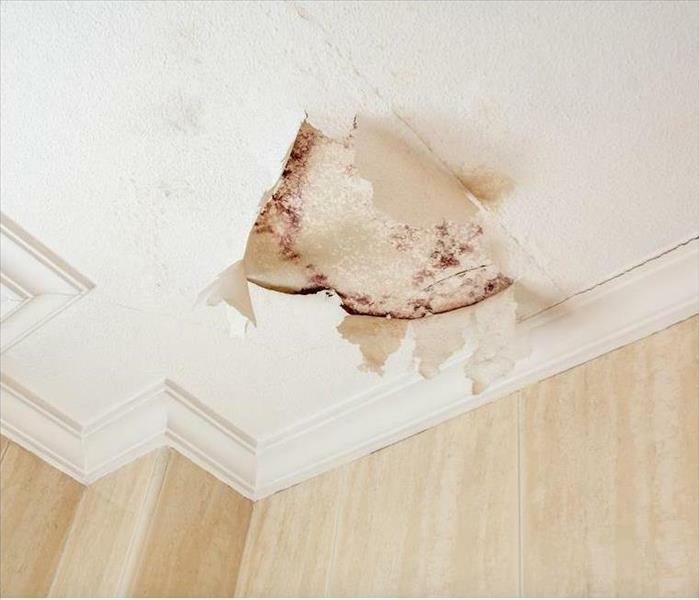 Our professionals can help you to get ahead of a potentially damaging situation by offering thorough inspections and lasting solutions to help reduce the risk of recurring mold growth. While many homeowners are unfamiliar with mold damage in Leon Valley and the effects it can have on their home, they still work to remove this organism as quickly as possible. The faster that you can get rid of mold colonization in your home, the better the chances of protecting affected surfaces and reducing the damage throughout your property as the colony spreads and affects new materials and contents. Our SERVPRO team has the resources and experience to identify mold growth and help to determine the source of the water damage that allowed it to occur. As with many homes in southern Texas homes, houses get constructed on concrete slabs for both stability and as an efficient foundation that allows for construction to begin shortly after the foundation gets poured. As a result, access to utilities like the bulk of the plumbing for the first floor gets concealed under the flooring of the main level of the house, which can provide a source of perpetual moisture if a joint in the plumbing has a steady leak. This leak is only one of several possible scenarios that could occur and allow conditions for mold growth. Our SERVPRO professionals assess the situation with thermal imagery cameras and leak detection equipment when we begin remediation work to remove active colonies. Determining and deterring the source of this moisture can prevent recurrences once our remediation work completes. If you have discovered mold growth in your home, let our SERVPRO of Braun Station remediation specialists help you get rid of the organism and offer lasting solutions to prevent further mold colonization in the future. You can reach us 24/7 by calling (210) 267-2159. Click here for more information about Leon Valley. 4/3/2019 - Is Professional Flood Damage Remediation Necessary in San Antonio? 3/16/2019 - What is a Pack Out and How Does It Help with Flood Damage Restoration in San Antonio? 3/7/2019 - Why SERVPRO for your Commercial Properties?